My dear brothers and sisters I am going to conclude our meditation on our promised verse Isaiah 43:19 with this last message. Hope these writings encouraged your faith in Christ. Isaiah 43:19 talks about three things. Firstly, God himself doing a new thing. Secondly, to see that the new thing has come now and thirdly God doing the miracle by making a way in the wilderness and rivers in the desert. So far, we looked at how the second point “now” really means in this verse. The first and the third point is something that which according to me is like a deep-sea thing. Because there’s so much to talk about those two points which the pages cannot hold. Why? Because the first and the last point of the verse is all about God and HIS miracles and the HOLY BIBLE is full of this awesome GOD and HIS miracles. It’s good to have the promise but it’s very critical to also look at who said that. A king’s word is always honoured and when a King says he really means it. If a king’s word can have that power how much more the word of God or the words that God spoke for you can have in your life. Read the scripture from Genesis to Revelation so that you will know who this great GOD is. The Bible says that HE is the creator of the heaven and earth and everything of this world (Gen1, Gen2). HE is omnipresent (Psalm 139 7-10, Proverbs 15:3). HE is the ruler (Psalm 103:19) and he has got all authority over the heaven and the earth (Job 9:12, Job 42:2). He is a powerful and everlasting God (Psalm 62:11, Isaiah 40:27). HE is faithful (Psalm 119:90) who gave his only begotten son Jesus Christ (John 3:16) for us who became a curse for our sins (Galatians 3:13). When he has given us Jesus as the sacrifice for our sins wont he give you the rest (Rom 8:32). So be cheerful and press on to the promise because HE is the king of kings and Lord of Lords (Rev 19:16) who will surely fulfil his word in your life. The third point is about his miracles. It says that god will make a way in the wilderness. Wilderness means an uninhabited, uncultivated or abandoned land or area. Is your life being like a wilderness. Are you saying that there’s no way to get out of this wilderness? Don’t worry as our God will make a way in your life of wilderness and put an end to all your problems. But please press on. God will make rivers in the desert of your life. Desert is an abandoned area without any water and hence am sure there is no progress and no growth in your life. But the God who is the river of life (John 4:14) will pour his living water in your life. You will not lack anything. When god delivered the Israelites from Egypt God himself met their needs in the wilderness and gave water in the desert (Exodus 15,16, Numbers 20). They didn’t lack anything on their journey to their promised land Cannon but they didn’t press on to the promised word of God and always murmured against God and His servant Moses. Yes, they didn’t press on. 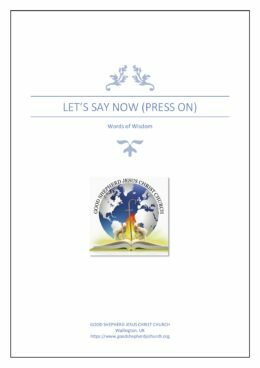 When I say press on it means to start or continue to do something in a determined way although it is difficult. It may look difficult to start with faith and continue your journey of faith in the life of wilderness or desert but do remember that you are surrounded by a great cloud of witness to run the race (Hebrews12:1) and running with Jesus who is the author and finisher of faith (Hebrews12:2) is with you. So, press on to your faith as we have a lord is who is able to provide you abundantly and beyond all that you ask for (Ephesians 3:20).